“Ivy league degrees and fancy MBAs are not what make an entrepreneur. Grit, perseverance and a superhuman ability to have faith in yourself does.” - Kalpana Saroj The chairperson of Kamini Tubes, or better renowned as the ‘original slumdog millionaire’, Mrs Kalpana Saroj, who despite of being born in poverty and subjected to inhuman abuse, overcame impossible odds to become one of the most sought after entrepreneurs in the country. Today she is at the helm of a $112 million empire that is growing rapidly. Her journey from being forced to get married at 12 by the societal norms to being the recipient of the Padma Shree award at 52 is not only inspiring, but also a lesson for us to dream big. 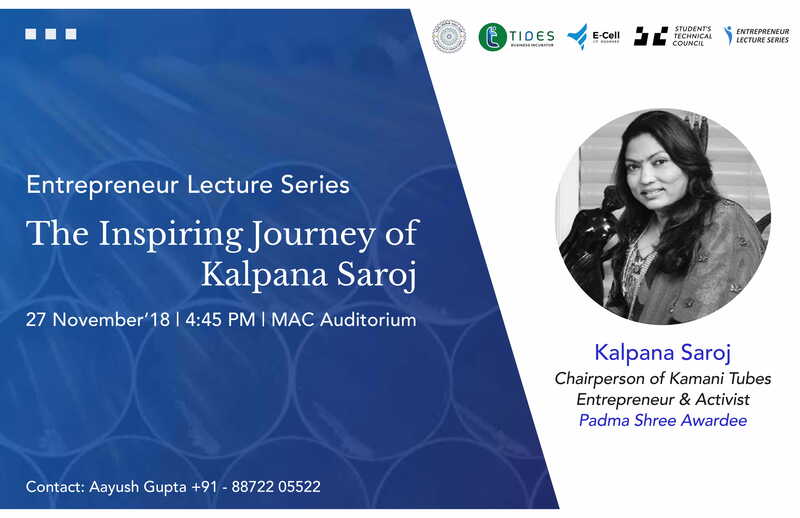 The Entrepreneurship Lecture Series flags off with Mrs. Kalpana Saroj as it’s first speaker. See you there at MAC Audi, 4:45 PM, 27th November 2018. Destination Uttarakhand Investors Summit 2018 will bring investors, industry experts, policy makers and entrepreneurs from domestic and international markets together with the dignitaries of the Government of Uttarakhand to help them explore the investment potential of the state and foster growth opportunities for all. TIDES Business Incubator has opened and extended the incubation facility to IITR Greater Noida Campus from May 8th, 2018. Initially, three startups from TIDES have moved to GNEC, and around 10 incubatee team members are working and staying in GNEC. 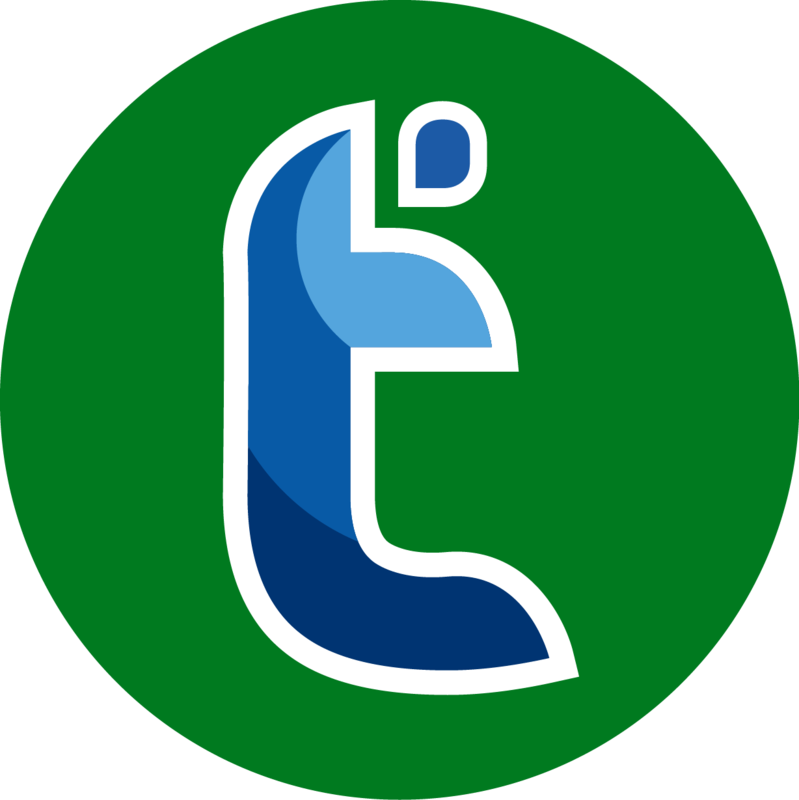 In the near future, TIDES plans to gradually increase the capacity of the facility to boost the culture of entrepreneurship of IITR. We would encourage persons associated with IITR community as students, scholars, faculty to reap benefits from the extended TIDES incubation facility at GNEC. Indian Oil Corporation Ltd., India’s flagship oil major has embarked upon promoting innovation eco-system by providing Financial & Intellectual Support to Start-Ups in the Hydrocarbon domain, under IndianOil Start-Up Scheme. Encouraged by the overwhelming response in Round-1 and enthusiasm of the young entrepreneurs, IndianOil Start-Up Scheme Round II is open w.e.f 1st June 2018, inviting applications/proposals through the online portal. 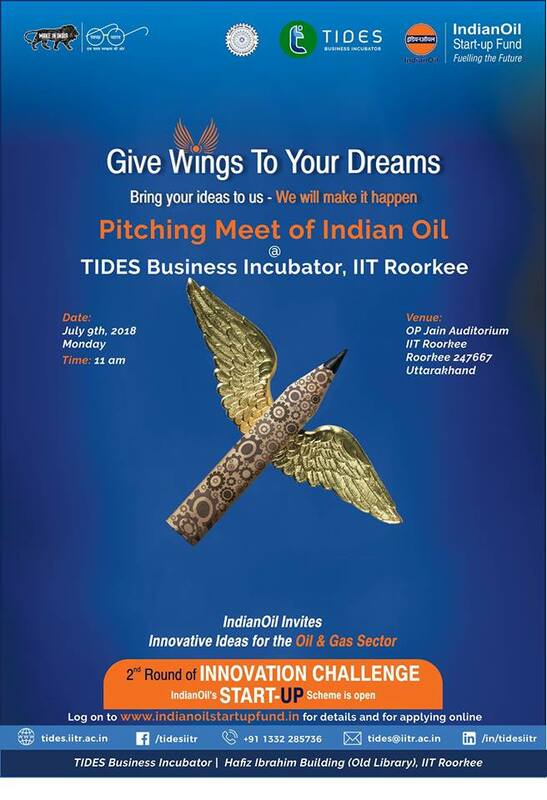 www.indianoilstartupfund.in To reach out to budding entrepreneurs and innovation enthusiasts, TIDES Business Incubator, IIT Roorkee in association with Indian Oil Corporation Ltd. is organizing “Pitching Meet” at Indian Institute of Technology Roorkee for the Uttarakhand and nearby region. Indian Oil will be conducting interactive-session with the interested people from the region, wherein IOCL team of executives will come and share inputs on the proposed scheme and the support provided under the Scheme. 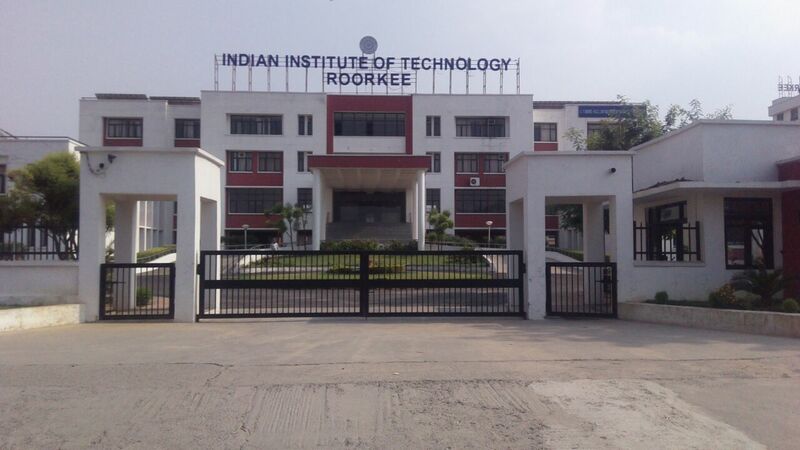 TIDES is organizing installation and training of LPKF CIRCUIT BOARD PLOTTER, LPKF PROTOMAT S103 from 28th May to 30th May 2018, Monday to Wednesday at Tinkering Lab, IIT Roorkee. Timings : 11:30 am, 29th May 2018 It is open for all, free of charge. Tech enthusiasts, please participate.